Honorable Mention, Animal Portrait Category, 2018 Wetpixel Deep Indonesia Underwater Photo Competition (USA). A cute blenny is moving out of her home consisting of beautiful green hard corals for lunch. The background is filled with a large school of fish, and the sun beams together with the bubbles from my regulators form a beautiful shape, which is like a starry sky. To combine the foreground subject with the high-contrast backlight background, I utilized in-camera double exposure technique. 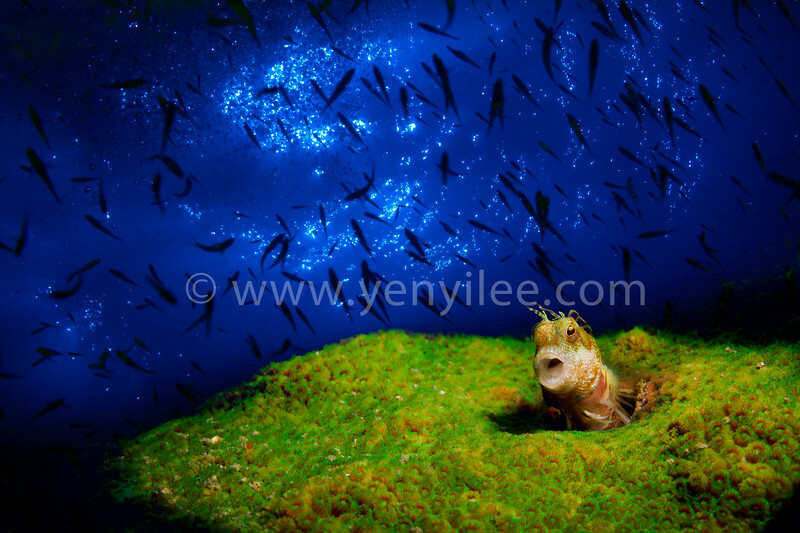 I used a strobe with light-shaping device (snoot) to illuminate the blenny, while I set high-speed shutter and close the aperture to capture the background. No Photoshop layer manipulation is involved in this work.